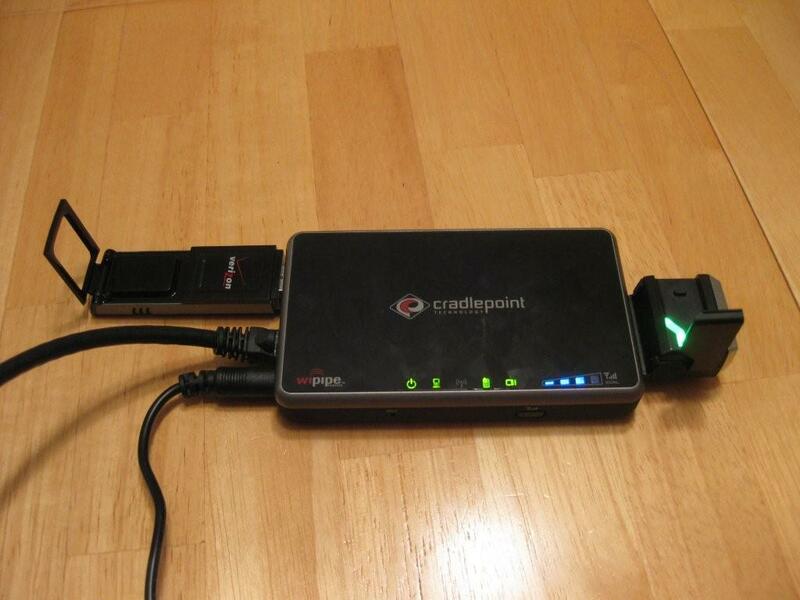 This evening I got an opportunity to test out a Cradlepoint CTR500 EVDO router that a friend of mine just got. This device can accept an ExpressCard or USB data card (or both at once!) from a long list of different providers. I tried it out with two Verizon EVDO cards, a Verizon (Novatel) V740 ExpressCard, and a USB727 card in the USB port. This model of the device is AC powered with a 5v adaptor and also comes with a 12v adaptor for your car. It has a built in wireless access point to share Internet connectivity out to other PC’s. There is a physical switch on the side to turn off the wireless access point. It has an Ethernet jack on it that can be used to directly attach your PC, or a network switch if you want to connect multiple PC’s to provide them Internet. The Ethernet jack can also be used to hook to some other upstream ISP and share that connection out via the built in wireless access point. There is a lock switch to keep the ExpressCard from sliding out of the device. There are a number of LED’s on the top to indicate status on each of the connection methodologies. The web interface to the device was nice and snappy. I did not dive deep into the features, but it looked pretty extensive (with really useful features like custom DHCP settings, rather than stupid consumer features). We had it setup to use both the ExpressCard and USB modem simultaneously, which is interesting, as it must choose which connection to route traffic out on a “per flow basis” (i.e. a TCP session or UDP exchange). This means some connections you make might get NAT’d out from one IP address, and others will come from a different IP. This could be problematic with some applications. The average ping time to my favorite IP address was 150ms, which is about the same as my internal EVDO card. 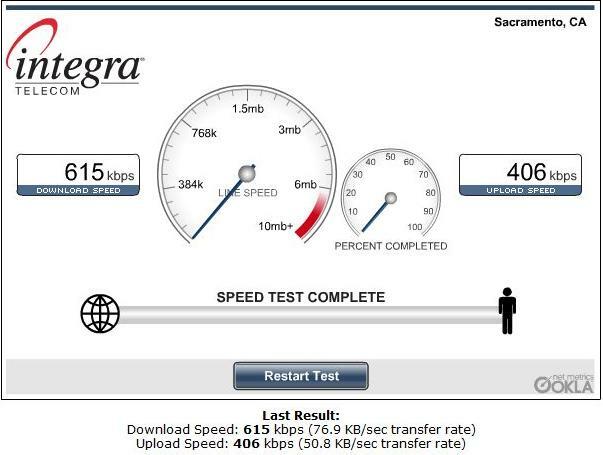 All of the tests I ran were with an Ethernet cable directly plugged into my laptop from the CTR500. I did not actually test the wireless access point in it since I was mostly interested with it’s EVDO performance and not the latency added by 802.11. I ran a number of speedtests, and while the numbers were not very impressive, they were the same as the Verizon EVDO card built into my Dell D630 laptop (which I also tested in the same location). The Verizon 1900mhz signal is fairly weak at my house where I ran the test (one bar according to my internal card). I did not have the right adaptor to be able to plug my 3 watt cellular amplifier into the EVDO cards which would have probably sped it up. I have to say, thus far I am extremely impressed with the device. The features are great, the fit and finish is excellent, it is fast and easy to use, and the price is right! The worst things I can say about it are that some apps might get confused with the dual card configuration (but this is not the routers fault, they implemented it the only way you could accomplish this feature), and the device did get somewhat warm during testing with two EVDO cards sucking power. I am not sure that I personally have a need for this device today, but I know a number of people who could use one! The CTR500 rocks!… there are a couple features you did not mention… maybe you weren’t aware of because of the limited time you spent with it. The CTR500 can be set to failover between cellular modems, not just load balance them while active. There is also a wifi antenna jack that allows for attaching a higher gain wifi antenna to improve range to and from the router.